The following series of eight introductory articles on navigation appeared in the Newsletter of the Melbourne Bushwalkers. There are questions relating to the articles for both expert and novice, with answers. Possession of a map, preferably of scale 1:25,000 or 1:50,000, will be helpful. All maps have a scale, usually represented as 1:25,000, 1:100,000 or similar. 1:25,000 means that the map is 25,000 times smaller than the ground - that is, that 1 cm on this map is equivalent to 25,000 cm on the ground (or 250 metres) - so 4cm is equivalent to 1000 metres (or 1 km) and vice versa. Also almost all the maps we use have a grid which can be used together with the scale to judge distances and can give a feel for the size of things. Have a look at the map below, which has a 1km grid on it – that is the grid lines are 1km apart. What is the longest dimension of Rocky Valley Storage? How far is it from Howman's Gap to Falls Creek? Roughly how long (to the nearest ½ hour) would it take you to walk at 4 km/hr around the shore of Rocky Valley Storage? You draw a line on a map from one point to another which is approximately to the north of you, where you want to go. You notice that the line is exactly parallel to the Magnetic North arrow on the declination diagram in the margin. Can you set the bearing without putting the ("Silva" style) compass on the map? What bearing would you set? The obvious answer is that it is possible to set the compass to zero, or zero plus or minus the annual variation, however this is incorrect. On most maps the declination diagram it just that – a diagram which is not necessarily drawn to scale. For instance on the Dargo Plains – Cobungra 1:50,000 map the grid north-magnetic angle is quoted as 12 degrees, but it actually measures 20 degrees! So the number of degrees quoted should be used, not the graphical diagram. By map legend I mean most of the things in the margin of the map. Let us look at this marginal information in order of importance. There will be a bar scale which you can use to measure things on the map. The actual “representative fraction” such as 1:50,000 will also be shown. The user should always keep in mind the actual scale of the map eg 1:50,000 , even though as we saw in the previous lesson it is possible to do some useful measuring without actually knowing the scale. The reason for knowing the scale is that it determines the level of detail shown. For instance, a 1:25,000 map shows farm fences, whereas a 1:100,000 map generally does not (except in sparse areas where the fence is considered as a navigational feature). It is essential that you know this for many purposes. We will discuss why in a future article. The date on the map always appears in the “credit note” – a little block of text that tells how the map was made, when, by whom, and any accuracy limitations. The actual symbols used to portray roads, streams, timber cover, etc. Note that just because something appears in the legend doesn’t mean that it will be shown on the map, even if it exists on the ground. A good example is fences. The legend will show them for most scales, but they only appear on the map if they have some significance. If there are lots of them, they are all left off because they don’t serve much purpose, whereas one isolated fence might be shown as an aid to navigation. Also each map series may have a different set of symbols to portray the same thing. For instance, on some maps roads are just plain red lines, and on others they have “casings” that is, a pair of parallel black lines filled in by a red infill. Lesser standard roads might be shown by a narrower red line in the first case, or in the second case, by leaving out the red infill or breaking the red infill into very small dots so that the line appears to be pinkish. This is a little diagram showing the relationship between various north points – more on this in a later lesson. Answer the following questions about any map that you happen to have. The maps most suitable would be any 1:25,000 or 1:50,000 metric scaled map for Victoria, and a good example is the Reedy Creek 7923-3-1 map which contains the area of a permanent rogaining course occasionally used for our club navigation training – this map or any map (perhaps of the area of your next walk, so you could test your skills), may be purchased from map shops (e.g. Melbourne Map Centre, Chadstone), or you could peruse one of the clubroom maps. What is the contour interval? Does it appear underneath the scale bar? How far apart are the grid lines? When was that map made? Has it been field checked? If so when? Are there any accuracy limitations? What is the symbol for a vehicle track? A foot track? Timbered areas? What is the value of the grid-magnetic angle? Because you used your own map, the answers will be different for each reader, so mark them all correct. On maps of 1:25,000, 1:50,000, and 1:100,000 the grid lines always have two digits. On a 1:250,000 map they only have one digit (except on some very old maps). Why is this so? The reason is to give consistency to grid references across all the scales mentioned. All grid references refer to the same point, regardless of the map scale. Moreover, all four figure grid references are accurate to 1000m. and all six figure grid references are accurate to 100m. None of these things would apply if the 1:250,000 map had two digit grid numbers, like the others. All the blue lines on a map relate to water. The reason we are studying them at this stage is because they help map users to get a picture of the country without using contours. The vast majority of the thin blue lines represent gullies which would only have water in them when it is raining. At the end of summer, almost all of the single line streams would be dry, and perhaps many of the double line streams as well (those with a blue infill between the blue lines). You may ask, “If most of the blue lines are dry most of the time, why are they shown blue, suggesting water?” There is a very good reason, and that is to help the map user to decide which are gullies and which are spurs, and to show the general shape of the country. Without the blue lines it would be harder to tell. Also the blue lines help us to define a watershed which is all the land upstream of a given point on a stream, and thus all the rain falling in the watershed will flow past that point. You need to be able to identify the main watersheds in an area, because the most desperate form of being lost is when you think that you are in one watershed when you are actually in another. This can be avoided by identifying the watershed boundaries so that you don’t inadvertently cross from one into another. Note that a watershed boundary never crosses a stream, no matter how small. Another use for identifying watershed boundaries is for determining the likelihood of finding water. Ignoring for the moment any considerations of geology or the presence of moss beds or springs, the bigger the catchment, the more likely it is that a given stream will have water in it. It is often said that if you are lost, follow water downstream and you will eventually come to civilization. Whilst this is true, streams often have the thickest scrub so the advice needs to be modified to suit the area. You are lost, but after examining the gully pattern, conclude that you are at L1. It is foggy, so you decide to follow the streams down to K where you left the car. The country has open timber. Would it work? What if you were actually at L2 in another catchment? Note the similarity of stream patterns. I have sketched the catchment boundary for point B. (It doesn’t cross any streams and all the water flows past point B). Sketch the catchment boundary for point G.
Rank the points B, G, K and F in the order of probability of finding water, most to least probable. Get out one of your own maps - either a 1:25,000 or 1:50,000 scale that shows hilly country - or access one of the club’s maps, (perhaps the 1:50,000 Bogong Alpine Area map which is a good example) . Trace your finger around the watersheds of various streams without referring to the contours. If you do several, you may begin to notice something about tracks and watersheds. What ? No, you would be in deep trouble. Correct if you didn’t cross any streams and arrived back on the opposite bank. K, C, B and F.
Most tracks follow ridges which are of course watershed boundaries. A friend has given you a compass from the Northern Hemisphere. Will it work properly here? No, the compass will not work perfectly although it will work. The reason is that the magnetic lines dip into the earth at opposite ends for the north and south hemispheres. To compensate for this compass needles are slightly heavier at one end. If you use a northern hemisphere compass here one end will scrape around under the glass because it will be out of balance. On a compass with no liquid it is quite noticeable. A grid reference is a number which gives a position on a map. Most maps have a little instruction box on them to show how to give a grid reference, but I will repeat the important parts here. Take for example the grid reference number 288769, it is actually composed of two parts, the Easting 288 and the Northing 769. Remember that the parts must be in alphabetical order, ie E,N. The Eastings are the grid numbers at the top and bottom of the map which increase as you move to the east, and the Northings are the numbers on the sides of the map which increase as you move to the north. With a six digit grid reference you need to estimate the tenth parts of the grid square (assuming that you are using a map of 1:100,000, 1:50,000 or 1:25,000 scale). Only use the large numbers on the grid lines, not the small numbers which are ignored. Make sure you understand how they are derived because from now on we are going to use grid references a lot. Note that a six digit grid reference is accurate to 100m on the ground. It is also possible to use only four digits to indicate a general area of 1km square. We are learning about grid references at this stage so that we can use them to locate specific features on maps. For instance they may be used in trip reports to indicate where you went eg – we started at Mount Warby GR (short for grid reference) 288769, had lunch at the creek junction at GR 278752 etc…. How accurate is a six figure grid reference, eg GR 321789? How do you remember which set of 3 digits comes first? How do you describe a point on a map without using a GR? Look up on a standard map (not the Bogong Alpine Area 1:50,000 which is a “special”) the “How to give a grid reference” and confirm that what I have said is correct. Can you work out how far you would have to travel to find a point with the same GR? They are in alphabetical order E, then N.
If you travel 100km to the north, south, east or west, (subject to some exceptions) the grid reference will be the same if it is not prefixed by the 100,000 metre grid square reference (which we would not normally use). You are following a straight high tension line but have lost track of how for you have gone along it. You look at about right angles to the line and see a prominent peak about 3 km away. You read a bearing to it (standing under the line but well away from a tower) plotting the bearing backwards to intersect the power line and thus determining your position. Later you discover that the position was in error by about 600m. What has gone wrong? What if you were 1200m out of position? If you were 600m away from the correct position, it would be because you forgot to correct for the grid-magnetic angle of 11 degrees. If you were 1200m away it would be because you applied the grid-magnetic angle in the wrong direction. The power line would have no effect as it is an alternating current. Contours are used on topographical maps to show the shape of the land. To the uninitiated they look like a mess, cluttering up the map, however to the expert they describe in great detail the shape of the country; its steepness, and many topographical features, such as knolls and saddles which aid in navigation. Each contour is an imaginary line at the same height above sea level. If the contour level is say 10m, then the next contour will be 10m higher than the previous one etc. Refer to the diagram below which shows some typical topographical features and the contour lines which define them. You need the drainage lines to read this diagram as there are no contour values shown. The drainage lines tell us where the low areas are. Without them we could think that the low parts were ridges. You can see the problem where it says “Gully” on the top border. Without the drainage line we have to examine the contours carefully to make sure that the gully is not in fact a spur. (A spur incidentally is a ridge running downhill, as distinct from a ridge such as the one on the left of the diagram through the summits). Because there are no contour values shown we do not know how far apart (vertically ) the contours are. Therefore we can only get a relative idea of the slopes. On a real map we tend to do much the same thing, relying on our experience to relate contours of a certain spacing to a particular slope on the ground. The rule is, the closer the contour lines, the steeper the slope. How many saddles (i.e. low spots on a ridge ) can you count? Which is the highest summit? Sketch the profile of the line A-B. Eight counting the one south of the knoll in the NE corner. Nine ignoring the knoll in the NE corner. The one in the SE corner. 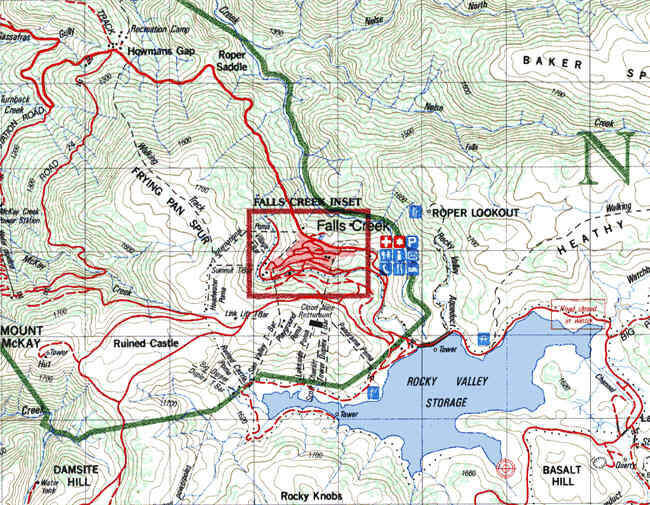 You are in an area where there is a known magnetic anomaly such as the one near Falls Creek at Mt. Jim. Is a compass of any use in such a situation? Possibly. For ordinary navigation no, however at a given location all bearings are affected equally by a magnetic anomaly. You can stand in one location, read bearings to several points, and if one of the points is a known one such as a trig, you can determine the compass error and then apply this error to all other bearings read from the same position. Thus, the angles at a point can be correctly deduced, however be sure to read all the bearings without moving, other than rotating. Usually about every fifth contour is shown by a heavier line. These are known as index contours. When looking at the general shape of the country you need only look at the index contours. The thinner non-index contours are only of use when looking at the detailed shape of the land at a particular location. When determining how far up or down, count the index contours, not every contour. To help answer the Q’s below, revision of Lesson 3 on drainage, Lesson 4 on grid references and Lesson 5 on contours may be useful. On the Warby Range map first look at the drainage pattern (the heavier lines). You will see that the water flows in the opposite directions on the two sides of the map. Therefore there must be a ridge (a watershed boundary) in the centre of the map. This fact alone should help you to visualize the general shape of the land shown. The land in the grid square bounded on the south west corner by GR 290750 (or 2975) is gentle, the next grid square to the north has some medium slopes in it, and the next one to the north of that contains some steep slopes (ie close contours). Just how steep you can work out if you are given that the contour interval is 10m and the grid square interval is 1000m. Why is the summit at GR 288769 called Mount Warby and not the one which seems more prominent at GR 288755? The latter grid reference is a knoll (which is a small hill on a spur or ridge). Just to the north of it (at GR 288758) is a saddle (which is a low point in a ridge). Find the closest knoll and saddle to the knoll at GR 288755 and record the grid references of each. What is the feature at GR 296753 ? Why is it located there? The map maker has shown drainage lines down many of the gullies to aid in interpreting the contours but some have been omitted by accident. Draw in the missing gully drainage line(s) uphill from GR 305762. Can you draw a line along the main ridge running N-S near the road? You will need to use the contours as the drainage pattern only allows you to get a general idea where the ridge is. (And the road does not follow it exactly). Check your delineation of the main watershed in the question above by extending all the drainage lines up the gullies on each side of the ridge, up to near the ridge. Does this help to define the ridge? Look at the points M (GR 290765), A (GR 274762), and D (GR 305777) and try to visualize what the ground looks like at each point. Assume that all the area is timbered. In which direction does the ground slope downwards? If rain fell at this spot, where would it end up, ie the grid reference where it leaves the map? Are there any other places within 1km (the size of a grid square) where the ground would look similar to each of the positions M, A, and D ? Good navigators ask themselves this question to see if they could be at another location which looks similar. The closest knoll is at GR 284760 and there is a saddle just to the north of it at GR 284761. Also possible is the knoll at GR 298755 and the saddle to the west of it at GR 295756. It is a dam because it is built across a gully. The gully drainage line runs due south from this point and then forks. Extending the drainage lines up to the ridge helps to define the ridge, except that you have to have some idea where the ridge is so that you can stop the drainage line! (a) east, southwest, every direction. (b) possibly, unlikely, very likely. (c) GR 311764, GR 265757, various according to which way the water started on its way down. (d) Yes GR 289757 is similar to M, GR 273763 is similar to A and nothing is really similar to D.
You are navigating through the Otways rain forest and have cut off the marginal information from the map to save weight but you remember that the grid magnetic angle on the recent 1:25,000 map adjacent to the east was 12 degrees east. Would it be safe to assume that the angle was essentially the same where you are? Most times its fair to assume the grid-magnetic angle would be very similar in adjacent 1:25,000 sheets. However, there is a boundary of the AMG (UTM ie Universal Transverse Mercator) zones near the Otways which shifts grid north by about 4 degrees as you cross the zone boundary, and this same 4 degree change appears in the grid-magnetic angle. Generally it is more important to be able to read a map effectively than use a compass, however a compass is essential in featureless country, fog, dense scrub or the like. The best type of compass for bushwalking is the orienteering type with the compass mounted on a flat rectangular piece of transparent plastic (the baseplate) and to have the needle in oil (as it allows the needle to stabilise quickly) Also the string attachment should be long enough to allow the compass to be held at waist level with the string around your neck. Other features are the line in the centre of the baseplate of the compass with an arrow on one end is called the “direction of line travel” or the index line, and the compass housing can be rotated in relation to its base. The base of the compass also has a thick centre arrow with parallel lines (Orienting lines) on either side of it. The red coloured end of the compass needle aligns to magnetic north (the direction of the magnetic north pole), which is usually different to grid north, which is the direction of the grid lines on the map. Don’t worry about true north (the direction of the geographic north pole) – it is of no interest to us for navigation purposes. Obtain a map (we will assume you have a compass as described above and illustrated below) – any map will do, just so long as it has grid lines and a declination diagram to the side (which shows the relationship between the various north points). Mark 2 points – say A and B. Imagine we are at A and will now attempt to get to B using the compass. Rotate the housing until the centre arrow on the base of it points towards grid north on the map. This may be accomplished by lining up the orienting lines on either side of the centre arrow so they are parallel with the grid lines running N-S.
Read the bearing on the movable housing where it intersects the index line. Say it is 40 degrees. Subtract* the grid-magnetic angle, say 11 degrees, giving 29 degrees. Rotate the movable housing until the reading at the index line is 29 degrees. Now to move off in the correct direction to B, hold the compass at waist level so that the index line points away from you. Rotate your whole body until the red end of the compass needle is over the thick arrow on the base. The direction that the index line points is the direction that you have to travel to go from A to B. * Anywhere in Victoria you will have to subtract, but in other parts of Australia you may have to add the grid-magnetic angle. An aid to help when converting the grid angle on the map to the compass bearing you would follow on the ground is to use the mnemonic “GrandMa’s Socks” ie Grid to Magnetic Subtract, and the reverse also holds when converting a magnetic angle to a grid angle – the grid-magnetic angle is added to the magnetic angle you have measured on the compass – so the mnemonic MGA (for the car) can be used – ie Magnetic to Grid Add. Following spurs downhill. In actual bushwalking you often have to follow spurs but care is needed. 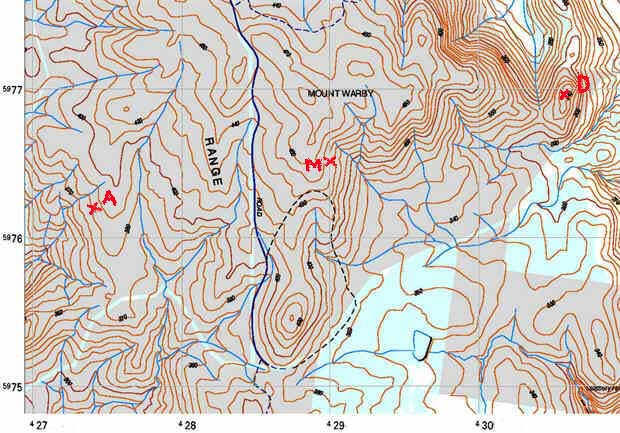 On a map ridges and spurs (a spur is a ridge running downhill from another spur or a ridge) appear to be very easy to distinguish. On the ground this is not so, especially in timbered country and it is very easy to walk off a side spur without knowing it. Not paying attention to where you are going or where you have been. The classic case is when you are following a track and fail to notice that you have passed a “Y” junction (it’s easy if the track comes in from behind). When you return along the track you are then confronted with a junction which you don’t expect (assuming that one of the tracks was created since the map was made) and if you haven’t been looking back occasionally to see what the terrain looks like you could quite easily take the wrong leg. You should know the date of the map and therefore have some idea whether it was made before any of the tracks on it. When leaving the track to a short period (say to look at flowers or a call of nature) you should leave your pack where you leave the track and pay attention how to get back to it. On a cloudy day it is easy to become disoriented and walk in the wrong direction. Once you realise your predicament, if you are unsure of which direction to walk, you should stay put and attempt to attract attention by calling out. Check the detail on the ground with the map frequently.